Our carbon & graphite PTFE rings are single or segmental sealing rings which are used for rotating shafts and reciprocating piston rods. Sealing is achieved by the spring which contains the segments coupled with uniform spring tension and it ensures perfect matching for trouble-free and smooth operation of the compressor or turbine. These graphite filled PTFE rings are used in steam, turbine, water & gas turbines, compressors & in different types of industries like sugar, cement, textiles, power plant and electricity board etc. The piston rings which are also used in compressors are used not only in the piston rod packing but also as components of pistons, piston rings and guide rings. 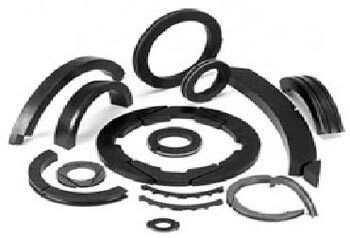 Additionally, we have carved a niche as the most prominent carbon PTFE rings manufacturer in India.